The herbal supplements market, in terms of value, is projected to reach around USD 86.74 Billion by 2022, at a CAGR of 6.8% from 2016 to 2022. This report includes estimation of market sizes for value (USD million) and volume (tons). 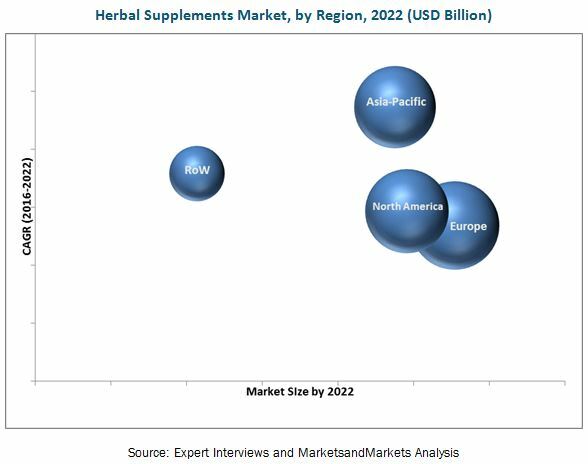 Both top-down and bottom-up approaches have been used to estimate and validate the size of the herbal supplements market and various other dependent submarkets in the overall market. Key players in the market have been identified through secondary research, such as company websites, annual reports, and their market share in their respective regions has been determined through primary and secondary research. All percentage shares, splits, and breakdowns have been determined using secondary sources and were verified through primary sources. The herbal supplements market value chain players are Archer Daniels Midland Company (U.S.), Glanbia plc (Ireland), Herbalife International of America, Inc. (U.S.), Blackmores (Australia), and Nutraceutical International Corporation (U.S.) among others. Maximum value addition of a product in the global herbal supplements industry is observed in the stages of product manufacturing. In the initial stage, the raw materials, which in this case, are the natural herb ingredients, are used for the production of herbal supplements. Value addition in the marketing and sales stages varies with key players, addressable markets, manufacturing units, and end consumers. The key companies that offer herbal supplements mainly invest in new product developments and production expansions through acquisitions and the development of new facilities. This research report categorizes the herbal supplements market based on source, function, form, application, and region. The global herbal supplements market has grown steadily in the last few years. The market size is projected to reach USD 86.74 Billion by 2022, at a CAGR of around 6.8% from 2016 to 2022. The growing awareness for preventive healthcare methods is the major driving factor of this market. The global market based on sources has been segmented into leaves, barks, fruits & vegetables, and roots. The leaves segment accounted for the largest market share in 2015 as herbal supplements are largely made up of plant leaves. Leaves of herbal plants contain medicinal properties, which are extracted for the production of herbal supplements. Ginkgo biloba and Camellia sinensis (green tea) are some of the common leaf extracts used to make these supplements. The demand for herbal products in medicines, food & beverage, and cosmetics has led to the growth of the leaves segment in the herbal supplements market. The global market, based on application, has been segmented into pharmaceuticals, food & beverages, and personal care. The pharmaceuticals segment accounted for the largest share of the herbal supplements market in 2015. The Latin American and Asia-Pacific regions are potential markets for herbal supplements in the pharmaceutical industry due to increased efficiency in research & development initiatives taken by manufacturers, as well as consumer preference toward herbal medications. The Asia-Pacific region is also expected to grow in the herbal drug market since consumers are demanding alternative medicinal products such as traditional Chinese and ayurvedic treatments. In the function segment, the market has been segmented on the basis of medicinal, and aroma. The medicinal segment accounted for the largest share in 2015. The medicinal function of herbal plants have no side effects leading to its increased demand. Growth is also expected in developing regions such as Africa, which offers a considerable opportunity for growth of the herbal supplements market in developing regions due to high consumer acceptability. On the basis of form, the herbal supplements market is segmented by capsules & tablets, powder, syrups, and oils. The capsules & tablets segment dominated the market. Consumers’ preference towards capsules & tablets due to its ease in consumption has led to its growth in the market. Moreover, high growth of the pharmaceutical industry in the developing countries, such as India and China have led to the demand for capsules & tablets in the herbal supplements industry. The herbal supplements market in Asia-Pacific is projected to grow at the highest CAGR during the forecast period. The major driver for the growth of this market include consumer reliance on the safety and efficacy of herbal products. Regulatory impact on future growth of the herbal supplements market is the factor restraining the market growth. The herbal supplements market is characterized by moderate competition due to the presence of a number of large- and small-scale firms. New product launches, acquisitions, and expansions are the key strategies adopted by these players to ensure their growth in the market. The market is dominated by players such as Archer Daniels Midland Company (U.S.), Glanbia plc (Ireland), Herbalife International of America, Inc. (U.S.), Blackmores (Australia), and Nutraceutical International Corporation (U.S.). Other major players in the market are NBTY, Inc.(U.S.), Arizona Natural Products (U.S.), Ricola (Switzerland), NaturaLife Asia Co., Ltd. (Korea), and Bio-Botanica Inc. (U.S.). 13.4 Herbalife International of America, Inc.
13.10 Naturalife Asia Co., Ltd.
*Details on Business Overview, Products Offered, Recent Developments, MnM View, SWOT Analysis, Key Strategies Might Not Be Captured in Case of Unlisted Companies.